The status of your church as a registered charity depends heavily on the treasurer to be aware of the regulations about receiving and spending charitable donations. 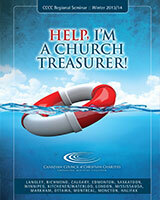 In addition, the treasurer is often the one who watches the church’s financial health and keeps its finances in good order. That’s a lot for a volunteer to do. Although this seminar is designed for church treasurers, the material is applicable to treasurers serving in any ministry context.